Jewelry pouches are not only user-friendly; they are also highly used by many females. 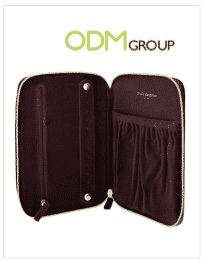 A high-end giveaway, this customized jewelry pouch is useful especially if your target clients are females. This gift with purchase from Lord and Taylor is only exclusive to people living in the United States. This jewelry pouch is given away with every purchase of Dolce & Gabanna’s perfume. Customized Jewelry Pouch is the ideal giveaway, if you are considering any. It is practical, user friendly and travel friendly! Read on more to find out why you should include customized jewelry pouch in your giveaway. Firstly, it is practical. Practicality in giveaways is extremely important because it ensures that your product would be used. Since giveaways are part of your marketing efforts and increase the reach of your potential clients. If the product is practical, people will use it and naturally, others will get to know about your brand. Customized jewelry pouch is practical because every lady with accessories would need to use it to contain their items. Secondly, it increases your goodwill among your customers. When your customers receive this highly valued gift, they would naturally think of your brand and company in the positive light. This could boost your relationship with your customers and increase their loyalty. Loyalty in your customers can bring you a long way in your line of work! There are many industries that can consider customized jewelry pouch as the giveaway. The fashion industry, however, is highly recommended to consider giving away jewelry pouches. This is because the giveaway is congruent to the products offered and the customers will associate the giveaway with your brand. This helps in the brand recollection of your company’s name and would boost in the customer loyalty. Do feel free to contact us for more details on your customized jewelry pouch today!